There’s nothing quite like a warm, buttery biscuit to have alongside your favorite meal—especially when it’s an ultra-low carb day! Biscuits are traditionally one of those carb-loaded dinner companions that many of us dream about having, but know we can’t because it’s an ULC day. 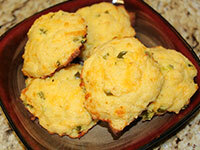 I’m excited to share this tasty, cheesy, moist biscuit recipe with you all! It took me several failed attempts at making these perfect, but I finally got it right. And, the best part is, these are just the beginning! Stay tuned for a few fun ideas for turning these cheesy biscuits into a full meal that’s sure to bring a smile to your face—and satisfy your tummy! 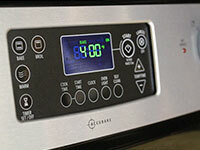 Set oven to 400 degrees and prepare a large baking sheet with non-stick cooking spray. Step 2: Mix wet ingredients. 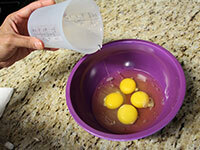 In a large mixing bowl whisk the egg and coconut oil together. 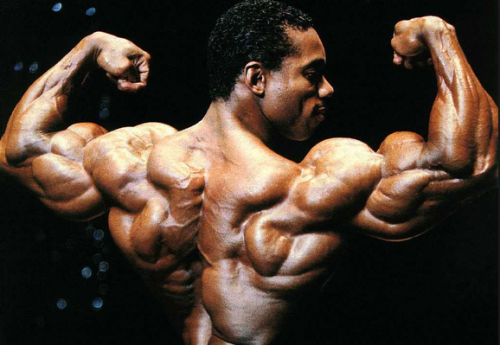 You may want to warm up the oil first if it’s solid in form. Step 3: Mix dry ingredients. In a small mixing bowl add the coconut flour, baking powder, onion powder and salt. Mix together with a fork, making sure to remove any lumps in the coconut flour. Step 4: Mix wet and dry ingredients. 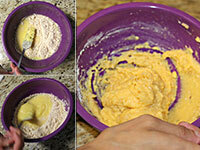 Add the dry ingredients to the large mixing bowl with the egg mixture and mix together until a thick dough is formed. Step 5: Fold in cheese. 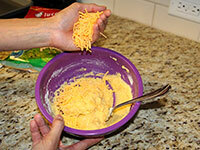 Add the shredded cheese to the dough and fold it all together. 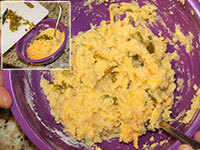 Add in the diced jalapenos and fold it into the dough. Step 7: Place dough on sheet. Using a large spoon, scoop out 5 servings of dough and place them on the baking sheet about 2 inches apart. 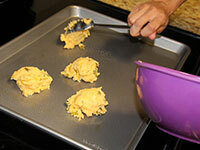 Try to keep the spoonfuls equal in size so that they cook evenly, and avoid pressing down on the balls on dough. You want them to be tall like biscuits, not flat like pancakes. 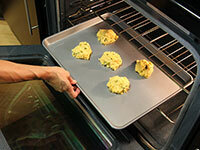 Place the baking sheet with the biscuit dough into the oven and cook for 12-15 minutes. 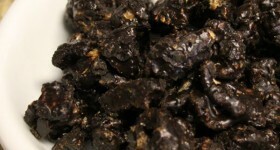 They are done when the edges are brown and the tops are a golden color. Remove promptly and let cool. Enjoy these as a tasty side to a high protein meal or, stayed tuned for scrumptious ways to turn these biscuits into satisfying meals! 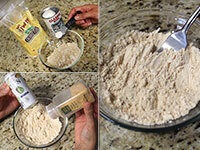 Usable Carbs: 2.2g – there is a trace amount of carbs in the Baking Powder so I rounded up in the total count. Keep this in mind if you are doubling up the recipe.